Soul Calibur was a game I played to death when it released on the Sega Dreamcast almost 20 years ago. Its varied cast of characters and eight-way directional movement systems made the series stand out and easily became one of my favorite games of the genre. While the series has been noticeably silent for nearly half a decade, Soul Calibur VI still brings with it the same addictive gameplay its always been known for, while also feeling a bit dry in its various modes and online offerings. Ever since Soul Calibur III, you have been able to create your own character and take them into some intense versus play. This latest entry does one better and has constructed an entire story mode based around their involvement in the Soul Calibur story. Dubbed Libra of Souls, this narrative heavy story mode has you joining alongside many Soul Calibur staples as you attempt to shut down mysterious portals that have opened up all over the countryside while also attempting to stop a madman from collecting the Soul Edge shards. This story does have some rather enjoyable moments, such as encountering Geralt of Rivia from the acclaimed Witcher series, or the few repeat encounters with some of the major Soul Calibur roster, but ultimately feels bloated with boring subplots and a difficulty curve that is just all over the place. Told through text-only dialogue and the odd cutscene, this mode can be a huge time sink should you not bore of it too quickly. Some conversations can go on for several minutes at a time while the battles that follow can often be completed in just a few seconds, depending on your level of skill, of course. While there is a set path you’ll take to complete the story, you will also encounter numerous side quests and activities along the way. As you push through the story, you’ll earn gold, new weapons, and various items that will buff your character with various stat increases. As you win fights, you will earn gold, and you will spend that gold to travel to optional events that are unlocked the more you push through the story. While some of these events are enjoyable, they almost always are comprised of generic fighter fodder with characters that look as if they were created in the character editor by simply pressing random, lack any personality to them whatsoever. While these fights can be over and done with quickly, so many of these side quests can be interrupted with ambushes where the opposing character could be 10-15 levels above you, causing the battles to be wildly inconsistent in their challenge. The best aspect of Libra of Souls is in the player choice of either following the path of good, or straying to one of evil. You will make various choices along the way that will shift the moral balance of your character and alter certain aspects of the story. Should you want a typical fighting game story mode, Soul Calibur VI offers that as well. The title’s second story mode, Soul Chronicles, is a retelling of the series’ origins that contains mini-narratives for each of the 20+ roster. Each character will have their own story that is told not only through battle, but with hand drawn artwork, in-engine cutscenes, and several visual novel style sequences. While much of the artwork is top notch, there are several times it disappoints on a colossal level, such as the picture used to cap off the story for Ivy Valentine. Between the two, I found Soul Chronicles to be the better of the available story modes, despite some presentation issues and some mediocre voice acting. Seeing each character’s involvement in the early moments of the lore can offer up some great fan service moments that are deeply entertaining. While it’s been announced that Nier Automata’s 2B will be making her appearance in a future DLC add-on, Soul Calibur VI comes ready with its first guest character: Geralt of Rivia. While I’ve already mentioned his involvement within the game, it was interesting to see him appear in both story modes, complete with the voice acting chops of Doug Cockle, his original voice actor. There are some lines of dialogue here that don’t feel inline with how CD Projekt Red have written him previously, but overall it was so fun to cut loose with the famous monster slayer and utilize his signature moves and sign attacks, a move-set I applied to my created character from the very onset. Creating a character in Soul Calibur VI is very straight forward, and at first, I wasn’t terribly pleased with the amount of items you are able to use. While some of those items are locked behind an in-game currency, one that is earned at a snails pace, the content here is more or less satisfactory. The real art in making this system work is by changing colors, adding items, and changing their textures in order to pull of some insanely cool looking characters. Soul Calibur VI launched alongside the Bowsette craze, so of course, at launch, the fan-created character was everywhere. I ended up making a Dark Elf Assassin that I was extremely pleased with, but overall, I wasn’t able to re-capture that same magic again since I used most of the best items already. The problem with some of the items here is that they are not modeled after the body you have, but rather a default size, causing certain items like pants or belts to look far too big and bulky and in most cases, look ridiculous. It is very possible to make some very cool characters, but I honestly feel that this mode could have benefited by including far more clothing options and variety. When compared to other fighting games like Dead or Alive, or Tekken, Soul Calibur always felt fun to play as its combat systems never felt dated the further the series went on. I still find the Tekken series to feel far too stiff, and the Dead or Alive games are fun to look at, but I never got hooked into how the games played. Soul Calibur is a series that I can instantly pick up and lose endless hours in as I would perfect the best way to ring-out my opponent, or sidestep an incoming strike and then unleash a brutal combo, which often, saw them fly right over the edge. Apart from mastering the best way to send your opponent into the vastness below, Soul Calibur VI has several gameplay systems that compliment a button mashing approach, or one of expert timing and button-perfect execution. One of the newest additions to Soul Calibur VI is the Reversal Edge; a rock, paper, scissors approach to winning a slow motion clash between both fighters. In this setup, vertical attacks will beat horizontal ones, horizontal beats kick attacks, and kick fulfills the loop and prevails over vertical attacks. While it is a system that can be mastered, much of it is luck based as it can be quite the chore to figure out what your opponent is going to deploy against you in the small window available. Returning to Soul Calibur VI is the use of Critical Edge attacks. While mostly unchanged from previous entries, Critical Edge strikes are flashy special attacks that can do some pretty decent damage and are just gorgeous to look at. Geralt, for example, knocks down his opponent, uses his Axii sign to control them to stand up, then attacks them with an fire-based slash. These attacks are possible when building up a gauge, then waiting for the right moment to unleash some pain. This gauge is also used for Soul Charge, which when used, allows the use of special attacks and abilities that will vary among the roster. Combine all these attacks with guard breaks, throws, kicks, and break attacks, and you have a perfectly refined fighter. One thing that separates Soul Calibur from the rest of the genre is in its eight-way directional movement. This allows each play space to be fully utilized instead of offering large scale environments and then never really letting you explore them. This allows you to bait your opponent, as well as create a bit of distance to enhance your chance of survival. One aspect of Soul Calibur that I haven’t touched upon yet is how this is a weapon’s based fighter. While you can jump and kick to your heart’s content, Soul Calibur has, and always will be, based around the use of weapons. Ivy’s whip-sword is back, as it Kilik’s stupidly long Bo-Staff, that can cause rage enduing moments with your friends as you keep them just out of range with a weapon that can often feel OP. This weapon-based element of combat reinforces just how fun and engaging the combat is, as it’s one of the few fighting games that relies heavily upon their use. While several fighting games can have you selecting fighters based upon their looks, Soul Calibur VI can often see you pick a character based upon their weapon. Thankfully, with the ability to edit and create characters, you can have your cake and eat it too. The biggest gap facing this recent release of Soul Calibur is in the available modes offered, or rather, the lack of them. Apart from the two story modes and the ability to create a custom character, you only have arcade, versus, training, and ranked or casual matches online left to choose from. Currently, the game doesn’t offer any sort of timed attack modes or survival bouts, which were present in previous entries in the series. The lack of these modes may not offend those just looking for some casual versus or online battles, but it can feel as if content has been removed when compared to what’s been offered before. While its content may feel dated in what is offered, the titles visuals are anything but. Soul Calibur VI is a gorgeous looking fighting game and it’s safe to say the series has never looked better. Characters are highly detailed and feature a vast assortment of fluid animations. That being said, there are still moments here where some moves can feel a tad robotic, but these occurrences are rare. About the only other issue that I have visually with the title is in the generic fodder you fight during the Libra of Souls story mode. While the main characters are wonderfully designed, these random opponents are anything but. 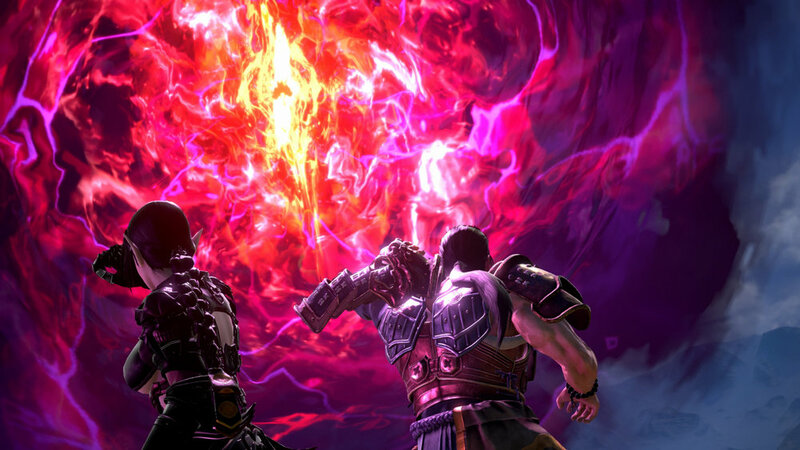 Soul Calibur is a franchise that hasn’t been part of the conversation in years. When most people think of the series, they often recall the guest characters like The Legend of Zelda’s Link, or that time when Darth Vader and Yoda showed up to the fight. Before that, Soul Calibur was one of the most popular fighting games of its time, and while Soul Calibur VI isn’t going to turn any heads, it is a solid fighting game with deep and engaging combat that is certainly worth your time, even if the title’s inconsistent offerings are all over the place. Soul Calibur VI was purchased by the reviewer.